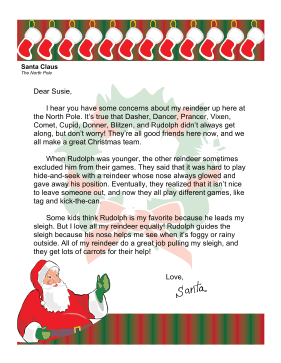 The social politics of Santa's reindeer are discussed in this letter for children with concerns. I hear you have some concerns about my reindeer up here at the North Pole. It's true that Dasher, Dancer, Prancer, Vixen, Comet, Cupid, Donner, Blitzen, and Rudolph didn't always get along, but don't worry! They're all good friends here now, and we all make a great Christmas team. When Rudolph was younger, the other reindeer sometimes excluded him from their games. They said that it was hard to play hide-and-seek with a reindeer whose nose always glowed and gave away his position. Eventually, they realized that it isn't nice to leave someone out, and now they all play different games, like tag and kick-the-can. Some kids think Rudolph is my favorite because he leads my sleigh. But I love all my reindeer equally! Rudolph guides the sleigh because his nose helps me see when it's foggy or rainy outside. All of my reindeer do a great job pulling my sleigh, and they get lots of carrots for their help!